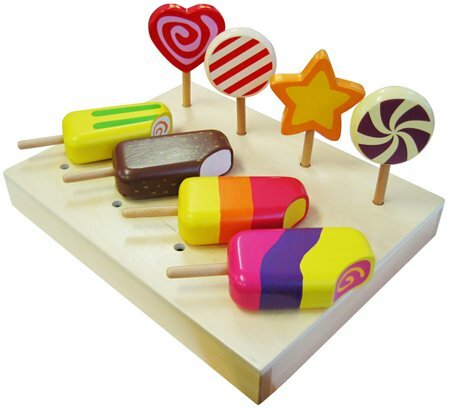 Wooden Ice Creams and Lollipops are a riot of eight colourful, tempting, sweet treats. The set comes with four multi-coloured ice creams, each with a bite taken from them and four lollipops with swirls and stripes. The box they come in has eight holes drilled in it and can be turned upside down and used as a display stand... great for playing shop. This is a fun colourful toy that is wonderful for role play. We like this because: "Really like the way the box can be used as a display. Ice Creams for Sale !."